There are many stories about the Colosseum. Many are partly or completely wrong, but some are true. 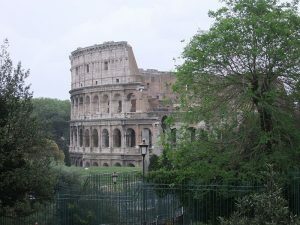 The Colosseum did host battles between various types of gladiators and between gladiators and wild animals both dangerous (lions) and gentle (giraffes, ostriches). Criminals were executed in it. At some point early in its life, its arena may have been flooded for mock naval battles, but it is not known how the Romans would have done this, if they did. Later in its life, there seem to have been elevators that were used to raise animals from subterranean cages to the level of the arena, where they could be released suddenly through trap doors. Huge awnings as big as sails could be spread over much of the seating area to protect spectators from the sun (not the rain). We do not know how many spectators the Colosseum could hold. Most of this, and much besides, will be familiar to readers of this book. Less well known are the plants and animals to which the Colosseum offers, or in the past has offered, shelter. In the middle of the nineteenth century, an English doctor and botanist, Richard Deakin, catalogued the many plants he found living in or on the Colosseum and published his catalog in a charming little book, Flora of the Colosseum of Rome. Deakin counted no fewer than 420 species of plants, of 253 genera. He found strawberries, grape vines, mint, and thyme. He found anemones, daisies, and roses. Some of the plants were, at least potentially, large. The giant fennel can grow to six feet or more, and dyer’s madder has roots three or four feet long. They “strike deep into the ground,” as Deakin put it, and could potentially damage the fabric of the building. Visitors now will not find so many plants, precisely because they weaken the ruins and so are removed by the archaeological service, but there are always some plants. Even a diligent caretaker cannot find and remove every blade of grass. No one, to my knowledge, has compiled a similar catalog of animal life in the Colosseum, but we can put together a short inventory of our own. It would include lizards, cats (who help reduce the number of lizards), mice, and insects of many species, as well as numerous birds, among them pigeons, crows, various songbirds, seagulls, ravens, and blackbirds. Some of the birds build nests, and some damage the structure by pecking and scratching in order to make hiding places for seeds and food. By 2012, birds of several species had become so numerous and so destructive that the archaeological service planned to introduce falcons to attack them and drive them away. I do not know if this plan was carried out, but it is good evidence for the size of the resident bird population. Murphey Hall is not as large as the Colosseum–it takes but a minute or two to walk around it–but over the years plants and animals impressive in both numbers and variety (not to mention courage), have made their way into or onto the building. Some of these, such as Professor Emeline Richardson’s airedales, were ushered into the building and given places in offices or classrooms by human friends and enablers. Others crept in surreptitiously. Once a good-sized and highly visible cockroach died midway up the stairs at the east end of the building. We, or at least I, passed the roach corpse every day for perhaps a week, wondering when it would be swept away by Housekeeping, and too lazy to dispose of it myself. For the most part, the animal life that entered the building came in through open windows. As we have seen, Murphey originally had no air-conditioning at all, and later only some window units. Until the renovation of 2001-2002, we all tended to open the windows at least some of the time, and when it was hot, as it often was, we kept them open. The windows are large, some eight feet high and two and a half feet wide on the two lower floors. There were then, and in 2016 there still are, no screens. Through these great apertures came a never-ending parade of miniature creatures. In the hot months of 1964 or 1965, a swarm of bees built a hive high in a tree at the southeast corner of Murphey, more or less level with, and just a few feet away from, the open windows of a graduate student office. All through those long months, the bees were constantly setting off from the hive in search of nectar, and inevitably some of them headed straight into the office, where they became confused. Students sometimes had to scramble to avoid them. That led to a closing of the windows, of course, but sooner or later the air in the room would be stifling, and the students would again throw the windows open. Up and down the windows went, down and up, until the bees moved on. In the 1980s, mud-dauber wasps built their tube-shaped nests high in a corner of my office, and the wasps would cruise majestically here and there, up and down the room. Bees and wasps, buzzing loudly, often entered rooms where classes were in progress. The students were surprised, bemused, and often alarmed, and they sometimes swatted at the insects or leapt from their seats to get away. Once, a particularly fat bumblebee entered one of my classes and flew slowly around the room, buzzing loudly as it went. We–students and teacher alike–watched, transfixed, but eventually I thought to turn off the lights and, no longer interested, the bee departed as coolly as it had entered. Less common, but more trouble, were birds. Once one came zipping into my office and, in a panic, flew all over the room, from spot to spot, everywhere except to an open window. I turned off the lights, closed all the windows except one, and lowered the blinds except for the one on the open window. Thus all was dim save the one bright, open window, with its fresh air summoning the bird to exit. The bird ignored this and continued to fly around crashing into things. I went in search of help, which came in the form of a tall graduate student who, with great patience and skill, was able to catch the bird (which by now was exhausted) and put it out the window. On another occasion, a bird got trapped in the second floor corridor and flew up and down the length of the building, ignoring an open door I provided for it, until I finally chased it to one end and so on out of the building. I always took a brown-bag lunch to work, and usually I put it in the departmental refrigerator for the morning. Sometimes I just left it on my desk. Typically, it contained a peanut butter and jelly sandwich in a baggie, fruit, yogurt, and a cookie. For twenty years or so after our arrival in 1963, Murphey Hall was covered in ivy, which grew from the ground up to the third floor and provided an extensive network of pathways for squirrels, giving them ready access to the open windows. One day, returning to my office after class, I surprised a squirrel who, in my absence, had entered my office, found my lunch, and attempted to get at the peanut butter. When I opened the door, the squirrel had torn through the baggie, eaten a bit of the sandwich, and started to pull the baggie and its contents toward a window. When I appeared, the squirrel panicked. What to do? Abandon the sandwich and flee? Try to save the sandwich at all costs? The squirrel chose safety: after a few last desperate tugs at the baggie, it gave up, let go, and leapt to the window sill and life outside in the ivy. I bought another sandwich at Y-Court. Aside from the ivy, many plants have come and gone, died or been replaced, around the outside of the building. One, though, may well have been planted in the 1920s, making it coeval with the building. This is a California incense cedar, still standing tall at the southeast corner of Murphey. It may well have been planted by William C. Coker, professor of botany from 1907 to 1945, as a groundskeeper suggested to me. Plants inside the building were generally under the control of humans. For years and perhaps decades, a papyrus plant dwelt in the office of the chair of the department. Papyrus is a marsh plant in the wild, and our specimen needed lots of water and good sun. It was a good classical plant, because the ancients made their equivalent of paper out of papyrus plants, so we tended it carefully and managed to keep it alive for many years. Various faculty kept plants in their offices. I regularly put too much water on mine and left circular stains on the surface below them. Peter Smith had beautiful ferns which he watered with a spray that they loved. The only truly significant plant, though, was Coker’s incense cedar at the southeast corner of the building. For an excellent succinct account of the Colosseum and its uses, see Amanda Claridge, Rome (Oxford 1998), 276-83. Much detail on the gladiators and animals will be found in J. P. V. D. Balsdon, Life and Leisure in Ancient Rome (New York and London 1969), 288-313. Most estimates of the Colosseum’s capacity put it at around forty or fifty thousand spectators. London: Groombridge and Sons, 1855. The Rare Book Collection of the University of North Carolina at Chapel Hill, currently housed in Wilson Library, owns a copy of this book. We do not know exactly how Deakin worked, if he had assistants, or how long it took him to assemble his catalog. We can infer that the work extended over several years, but Deakin does not describe his methods or equipment. He also does not speculate on how all these plants came to the Colosseum. Presumably airborne seeds account for many species. In addition, seeds or bits of plants may have clung to humans, animals, or objects such as clothing or items for sale in the lower arcades, and thus may have been carried inadvertently to the building. Nick Pisa, in London Telegraph online, March 4, 2012. Philip Stadter remembers a beekeeper coming to move the hive at some point. Coker was a member of the Building Committee. His name is recorded on the cornerstone, dated 1922, at the northwest corner of the building.